Jan. 24, 2017, © Leeham Co.: SkyWest Airlines, which stunned the aviation community in 2010 with an agreement to order 100 Mitsubishi MRJ90s and options for 100 more, is sticking with the airplane so far in the wake of another delay. The Japanese company Monday announced a new delay of two more years, making a total of seven. Entry-into-service with launch customer ANA is now slated for 2020. Before this announcement, SkyWest was slated to receive its first airplane in 2019. 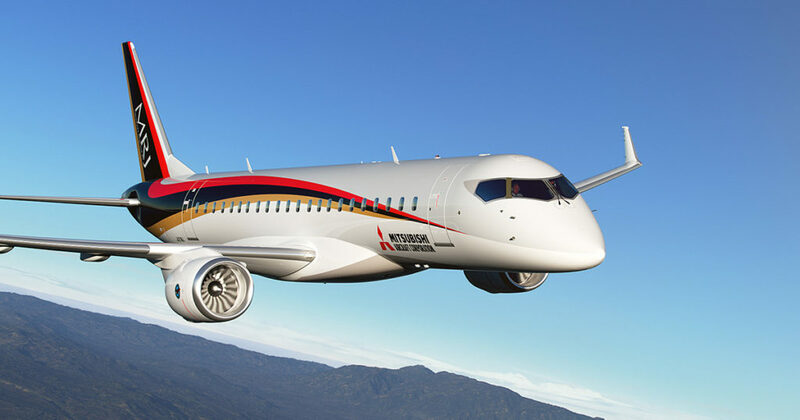 “Our conditional firm orders of the MRJ aircraft remain unchanged, and are dependent on flying contracts and scope availability,” a spokeswoman said in an email to LNC. Mitsubishi lists the SkyWest order as firm on its web site. LNC noted in a post last week that US pilot contracts contain “scope clauses” that the MRJ90 exceeds the weight limit in the scope. This is the scope reference in the SkyWest statement. SkyWest also ordered 100 Embraer E175-E2s. Entry-into-service of this aircraft was rescheduled to 2021 because scope clauses weren’t revised in recent labor contract agreements. The E2 also exceeds the 86,000 lb MTOW scope limit. The first SkyWest aircraft was originally scheduled for delivery in 2020. Trans States Airlines in the US placed an order for 50 MRJ90s with 50 options. Like SkyWest, the order is believed conditional on scope clause relief. SkyWest and Trans States account for two-thirds of the orders and commitments in the MRJ backlog. Its really not that easy to do, its a lot of weight. The orders don’t seem that firm to me. No one is expecting scope to be changed…. So….. SkyWest order’s is not firm, it’s conditional firm. It will become firm only if scope clauses are revised to allow the MRJ to be flown as a regional jet. So it’s about as firm as Porter’s conditional firm orders for the CS100. What will happen first? Jets at Billy Bishop or more permissive scope clauses? tying scope clauses to MTOW is dumb for both airlines and pilots. What (mainline) pilots want is to restrict the airline from subcontracting flights carrying more than M people or flying more than N miles and could frankly give less than one hoot about which particular aircraft they use to do it. both sides should be fighting for a simplified scope clause of aircraft can seat no more than 90 (or 85 or whatever number they can agree on)/ route restricted to 1500 KM (or some similar number). this frees the airlines to provide the small market/short range service using the best available aircraft while delineating a bright line boundary for determining when service can/should be operated by mainline pilots. This also frees the aircraft manufacturers from arbitrary weight limits and allows them to optimize design to maximize performance to a specific mission spec. side issue, one has to wonder why Regional pilots haven’t unionized. they work extremely long hours at effectively slave labor wages for years in the hope that they might get picked up by a Major. given all the constant chatter about pilot shortages, one would think that a regional’s pilot cadre would be able to improve compensation and working conditions just by threatening to strike. there isn’t that large a surplus of people sitting on the bench with valid commercial licenses that the regional would be able to backfill in a timely manner. Wonder if this ongoing EIS delay can allow Skywest to cancel the order? Is there something from Embraer that could take its place? Its Mitsubishi’s first foray into jet airliners and it could possibly incur a further delays. Poor execution on Mitsubishi’s part. Sounds more like this fits perfectly for SkyWest. Scope clauses haven’t changed yet so they aren’t ready for delivery of any MRJ90s. Exactly! At this point, they can probably cancel (or defer) the order at any time up until a year or so before they receive the first aircraft. So why not just kick the can down the road for now? If scope clauses stay the same, you’ll probably just see more current-gen Embraer E175s. That’s definitely the RJ of choice right now. But the airlines would surely love to move up to the E175-E2 and MRJ90 if scope clauses allowed that. There is this news that appeared a few days ago and has not been commented correctly: Bombardier is activating to find an engine to launch the CRJNeo. No doubt Skywest will be most interested! Sounds like GE/Snecma passport engine would ideal for this project. Its going on the Global 7000 and includes technologies from the LEAP series. However that version may be more suited to long range cruise rather than short hops. I would bet GE doesnt want to be left out of the regional jet category. When they certify the MTOW can anyone tell me, do they include an average weight for the seat?There’s quite a bit of weight to be saved with the new style titanium /carbon seats, but I can’t imagine that they take account of all the different seats that the consumer might spec. P&W might be able to lose some weight and improve fuel economy thereby reducing the weight of fuel. Did they miss the target for the scope clause or were they never aiming for it?